The GOP candidate is creating fear and confusion in children, especially kids of color. Here are three suggestions for talking with kids about race and racism in the media. "Mama, I sure do hope this Trump guy doesn't win." That's what my son said to me as he hopped into the back of the car after school. I was caught off guard. I wasn't even aware that my seven year old knew about real estate developer, reality-TV star, and GOP presidential candidate Donald Trump. 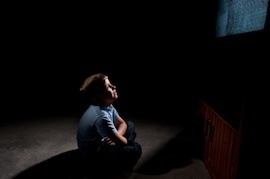 Like many parents, I assumed that I was protecting him by limiting his exposure to television. I asked, "Why don't you want him to win, baby?" "Well, if he wins, he wants to send people back to the countries where they are from," said my son. "So what is he going to do with me? Send my arm and leg back to Africa, send my other arm and leg to Mexico, and the rest of me back to different countries in Europe?" This is the message that many children are getting from Donald Trump's campaign for President of the United States. In speeches and interviews, Trump has repeatedly painted whole categories of people as rapists, murderers, terrorists, and more. Worse, many of his followers act aggressively hostile toward people who don't look like them: People of color who have dared come to his rallies have been targeted for physical and verbal violence, which Trump has explicitly condoned. As he said at one press conference about violence at his rallies: "The audience hit back, and that's what we need a little bit more of." None of this is covert or secret. It's all over the news, and kids do talk amongst themselves about what they see and hear in the media. While he is not the first or the only political candidate to promote racist beliefs and practices, ubiquitous media coverage of his campaign has amplified his message--and kids like my mixed-heritage son are hearing what he has to say. When Donald Trump speaks, he creates fear and confusion in children, especially kids of color. Of course, negative messages from the media about race will be a problem even long after Trump is defeated. So when we talk with kids about Trump, we're really learning to talk about a subject that defines American history and daily life. How can parents and educators deal with children's concerns and questions about race and racism, while instilling some hope and a sense of empowerment? In a PBS interview a few years back, Beverly Tatum, a clinical psychologist and former president of Spelman College, explained that messages about race are like a smog, filling the environment with ideas about who is good, who "counts" as a person, who is to be feared, and who is revered. When our kids see a white man on TV sucker-punch a black man at a Trump rally, they go to school and have conversations amongst themselves about what they've seen. Young children are breathing this smog and learning very quickly about who "belongs" and who doesn't. But we need to remember that young children, and even adolescents, are doing this with their young brains. Even as bright, sophisticated, and smart as all of our children are, they are still learning about race within the context of what their developing brains can understand. They're still learning how to categorize--who belongs in what group--and what counts for membership: "Are all Mexicans bad people?" "Are all brown people Mexican?" "Are all Spanish speakers bad because they are Mexican?" Rebecca Bigler at the University of Texas and her colleagues have shown that children under the age of eight tend to make big generalizations because they have a hard time seeing people as individuals; instead, they tend to see them through their group membership. These generalizations in the context of the current smog are leading to distress for many children, especially those who are getting the message that they and their families are bad and deserve to be sent away. Children can and do put themselves in one category and their parents in another, which in this smog can trigger anxieties. Another mixed-heritage little girl in my son's class worried that she would be separated from her mother because Trump wanted to send brown people away--and she was dark while her mother was white. Canadian researchers Anna-Beth Doyle and Frances Aboud have found that children under the age of eight tend to think of race like my son did, as something flexible that can be altered or shared--by, say, rubbing on someone's arm, or laying in the sun and getting dark, or being divided into legs and arms. As our brains mature, for better and worse, we come to see race as a fixed trait. In a way, my son's accurate perception of himself as mixed is coming into conflict with the tendency of the adult world to push human beings into single racialized categories that are closely tied to power differences. The upshot of the research is that kids are working hard to make sense of race--categories of belonging and difference--and they do this differently than we adults do. This process leads them to both overgeneralize and think that perhaps race can be changed or manipulated. But these are typical stages in their human development. When a child overgeneralizes, it's developmentally appropriate--and not "racist." When an allegedly mature adult like Trump--in a position of power to influence others and, potentially, policy--makes a generalization about an entire group of people, he does meet the dictionary definition of "racist." For many of the children I know as a mother or in my work as a psychologist, this smog is making them feel like they don't belong--and it may, I'm sorry to say, be feeding a sense of entitlement among other children and teens. In other words, the rhetoric and behavior of the Trump campaign is divisive, and it can have a real social impact, as we saw when white high school students in Indiana chanted "Trump" and "build a wall" to predominantly Latino students from another school. This is coming up on playgrounds, when kids tease each other with "He's gonna send you back to your country." It comes up clinically, when (as a white therapist recounted to me) her Latino eight-year-old client asked her, "Who are you voting for? Do you not like Mexicans either?" It even comes up in the back of my car, as I have to answer my son's question about whether he'll be sent away. The success of Donald Trump's candidacy isn't just a political problem. It's also a psychological and cultural one that needs to be addressed by parents, educators, and mental health professionals. So what can we do? Here are three suggestions. Children need our help to see the smog--and once they do, they'll need our help to navigate through it. Pretending the smog doesn't exist--or that we "don't see race"--is not a solution, from a psychological perspective. Even if we choose a strict media diet, our children--yes, even young children--are breathing in messages about race, citizenship, and belonging. It's up to us to check out this smog by asking questions about their understanding of what's going on, how they are making sense of the world around them. Many parents worry that by asking questions about Trump, they will bring him and his message into their children's awareness. It's compelling to think that our silence as parents protects our children...but it doesn't. Silence in the face of discriminatory statements about women, different races, and immigrants makes us complicit in Trump's message. If we don't talk to our children about these messages, we are allowing others to dictate how our children understand race. Maybe that's OK with you--but if it's not, you will need to create a different narrative by having a conversation with your child. Have you heard about the election? What do you think they are like? You can (and probably should) also check out what might be happening in their environment: "How are kids getting along at school?" After you've posed the question, your new job is to listen. You have to be willing to listen as much--or even more--than you talk. Make sure you listen to how your children are thinking and understanding. This is hard for everyone, including me. My son later said, "I think that [my friend] Peter is going to vote for Trump." I immediately assumed that he heard Peter say this--and so I launched into a lecture about different people's opinions. He (thankfully) interrupted me and said, "I think he wants to vote for Trump because he's white." He added: "Do all white people vote for Trump?" I was so preoccupied with the "right" thing to say, that I hadn't paused to ask him more questions about his thinking. I wasn't really listening. He was making a generalization about white people, one that I could have missed if his interruption hadn't slowed me down enough to listen some more. Instead, I could have asked, "I wonder why you think that?" Wondering with children about their understanding is a great way to listen a little harder. The election is a great opportunity to talk about differences of opinions, how to disagree, and how to advocate for a cause. It's a chance to help children learn about our perspectives and our values. When parents ask me how to have tough conversations with their children, I encourage them to do a bit of homework first--by studying themselves. What's important to you? What kind of world do you want your kids to live in? What would your family motto be? What is your family mission statement? What kind of messages does your family want to send about race, politics, and politicians like Trump? Come up with a family statement about how you feel about the election. Write a letter to the candidates. Watch inspiring anti-racist speeches on YouTube. Take your kids with you to vote. These are all ways to teach our children about how we feel and also to help them develop strategies of coping. If the smog is making kids feel bad, taking action can help them feel empowered, connected, and supported. In the case of relatively privileged children, participating in action can help them counter feelings of bias against people who are different from them. Much of the behavior we are seeing this primary season is "childish": name calling, pushing, shoving, finger pointing. I find that when children see this behavior, they are often shocked, and they may find it silly that adults would act this way. It's a great opportunity to talk about how they feel when they see such behavior and how we think about it--and it's a way for us to draw lines about what kind of behavior is appropriate. Did you notice how those people were treating each other? We are not a family that believes that we should use violence to get our point across. We think it's really important that people get to express their opinion even when they disagree. These conversations matter to our kids. The way our most influential grown-ups behave and speak about women, immigrants, and each other matters. When a presidential frontrunner claims that all Mexicans are rapists or that Muslims should carry a special ID, those are not innocuous sound bites. They can become part of the foundation of how children understand our government, civic life, and relationships. And they can seep into the smog that affects children, influencing how they get along with others and how they view themselves. In short, these messages are shaping what kind of society we are becoming. There are children having a hard time going to sleep tonight because they fear being separated from a parent. I, like many others, thought we were done with having to put our children to bed with such fear--but clearly I was wrong. Today, we have an opportunity and a responsibility to speak up and be role models for our children.